Enjoy knitting or learn to knit with a friendly group who meets Thursdays between 1 and 3 p.m.
Congratulations to﻿ ﻿the Knitting group for their participation in the Red Scarf Awareness campaign in partnership with Réseau ACCESS Network. 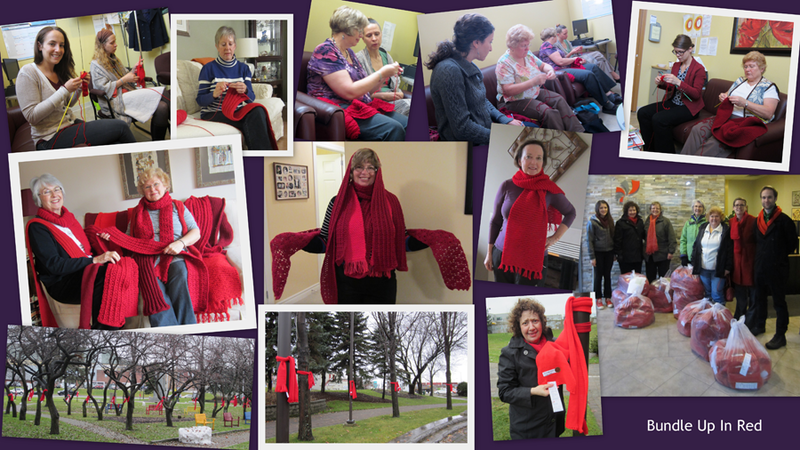 Over 330 hand-knit scarves and 1,200 fleece scarves were distributed for the campaign. The project was even featured in the CFUW national "News & Updates" newsletter. Click here to see more about the project. Thank you to Elaine for sharing the following patterns, Knitting Instructions for War Work and Knitting for the Navy.